With hipsters and suits gathered at Williamsburg's gritty Public Assembly performance space last night for the announcement of Vice and CNN.com's content partnership, the question on everyone's mind -- from the chatty, open-bar fueled crowd to funnyman MC Eugene Mirman -- was, "What's going on?" 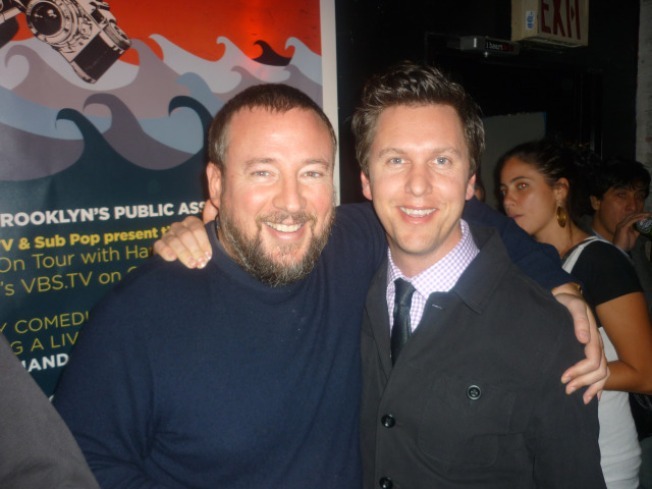 How had two such seemingly disparate brands, respectively piloted by CNN.com's Senior Vice President and General Manager KC Estenson and Vice's hard-living co-founder Shane Smith, found common ground? "F--- Ted Turner, this guy's the man!" a thoroughly hydrated Mr. Smith shouted, pointing his big paw at a comparatively buttoned-up Estenson. After mistaking the youthful SVP for an intern during their first meeting, the Vice overlord brought his new CNN chum to the nearby Hotel Delmano (his favorite bar in New York), where he proceeded to get "wasted" and launch into a tirade that left no major news network -- all purveyors of "infotainment" in Smith's eyes -- unscathed. "But these guys," Mr. Smith continued, "do news, and so there's no other partner for [Vice] to have because CNN is the only company doing real news now." Estenson, clutching a can of Tecate, suggested the admiration was mutual: "With Vice, you know, they deal with a little bit of a different twinge. Their news is packaged and edited to power chords, which we don't do a lot of, but the world needs more power chords. The world needs more truth telling. The world needs more authenticity. I mean, why not? I figured that these two brands really reinforce each other in a great way." Critics might argue that the partnership is less synergistic and more stunt-y, a tactic in which Mr. Smith -- who grew Vice from a fledgling Montreal magazine to a multichannel media conglomerate with his own brand of hipster hustle and chutzpa -- is well versed. “Look, come on, we thought, 'CNN doing an event in Williamsburg? It’s insane.' This will probably get way more press than an event in Manhattan,” he said. “You do an event here and it’s actually news. It’s a story. [CNN] took a chance and it’s a great thing." Whatever the brands’ collective intentions and whatever the outcome of this odd partnership, one thing was certain last night according to Estenson: "There's absolutely no doubt that Shane has more alcohol in his veins than all of CNN's employees combined."